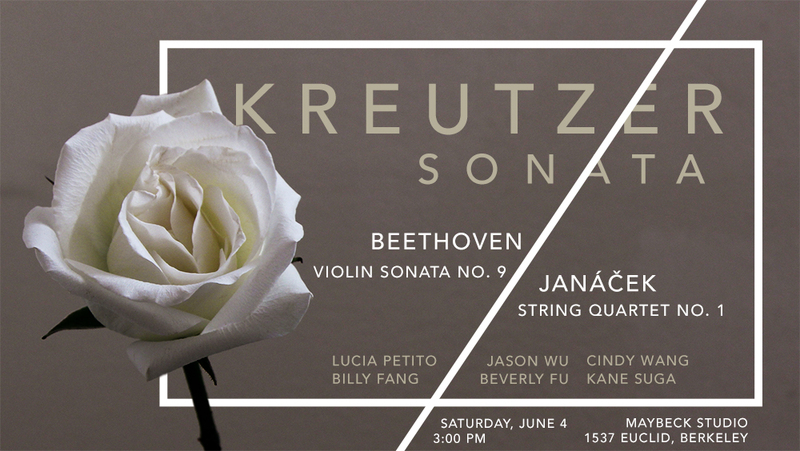 When Beethoven wrote the tempestuous Kreutzer violin sonata in 1803, he had no idea that it would take on a life of its own. Almost a century later, novelist Leo Tolstoy used the sonata as the setting for his short story of the same name. In Tolstoy's version, a suspicious husband encounters his wife performing the Kreutzer sonata with a handsome violinist. Enraged and inspired by the passion of the music that passes between them, he murders her in a jealous rage. Years later, the Czech composer Leoš Janáček spun the dramatic events of the short story into a string quartet, making his own mark on the Kreutzer Sonata. Join the musicians of the Sophia Ensemble as they explore the themes that inspired three of the world's greatest artists. The Sophia Ensemble is comprised of UC Berkeley students who are also principal musicians from the UC Berkeley Symphony Orchestra. They take their name from Sophia Tolstaya, the wife of Leo Tolstoy. Ludwig van Beethoven: Sonata No. 9 in A minor, Op. 47 - "Kreutzer"
Leoš Janáček: String Quartet No. 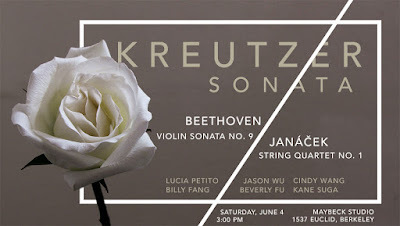 1, "Kreutzer Sonata"
The Sophia Ensemble is comprised of UC Berkeley students who are also principal musicians from the UC Berkeley Symphony Orchestra. They take their name from Sophia Tolstaya, the wife of Leo Tolstoy. Lucia Petito, violin, is a Ph.D. candidate in biostatistics. She studied violin performance at the Eastman School of Music under the tutelage of Mikhail Kopelman. She currently serves as the concertmaster of the UC Berkeley Symphony Orchestra and frequently performs chamber music in the East Bay. Billy Fang, piano, is a first-year Ph.D. student in statistics, having completed his undergraduate degree in mathematics at Princeton. He has studied piano with Dr. Eunbyol Ko and Dr. Christine Kefferstan, and was a YoungArts finalist in 2011. Billy also plays violin in the UC Berkeley Symphony Orchestra. Jason Wu, violin, just completed his J.D at UC Berkeley, which he also attended as an undergraduate. He is the principal second violin of the UC Berkeley Symphony Orchestra. He has also served as concertmaster of the UC Berkeley Summer Symphony and Chamber Orchestra. Beverly Fu, violin, is a third-year undergraduate studying Chemical Biology and Computer Science. She began playing violin in the fifth grade and has studied with Ker Qi and Abraham Becker, and has performed in a variety of ensembles, including the Young People’s Symphony Orchestra. Beverly currently studies with Dan Flanagan and is one of the co-concertmasters of UC Berkeley Symphony Orchestra. Cindy Wang, viola, recently completed her Ph.D. in Molecular and Cell Biology. Her orchestral credits include the UC Berkeley Symphony Orchestra, the Beijing International Chamber Orchestra, and the Harvard Bach Society Orchestra. She holds a. A.B. from Harvard College, and remains an avid chamber musician, graphic designer, and freelance photographer in the Bay Area. Kane Suga, cello, is a fourth year undergraduate student in the Department of Music at UC Berkeley. Kane has performed in masterclasses for Stephen Geber, Astrid Schween, the Kronos Quartet, and the Danish String Quartet as a soloist and chamber musician. He currently studies cello with Leighton Fong and is associate principal cellist of the UC Berkeley Symphony Orchestra.